Dumaine Radcliff, James Olivard, Derek Luke, Austin Nichols, Kip Weeks, Al Shearer, Samuel Garland, Mitch Eakins, and Alphonso McAuley wear white high top and black high top and low cut Converse “Chuck Taylor” All Stars in the film. Coach Don Haskins and the Texas Western College basketball team in practice. Sports and race share a past as checkered as any institution in America. 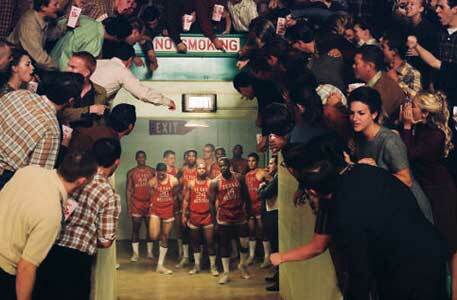 Like the vast majority of the South during the 1960’s, college basketball was a mostly segregated affair. Teams fielded all-white lineups and African-American players were rarely recruited. Yet during the 1965-66 season, newly appointed Texas Western College coach Don Haskins broke the mold. With a team of seven African-American and five white players, Haskins led his team on an improbable run to the NCAA National Championship game against an all-white Kentucky team led by the legendary coach Adolph Rupp. That story gets the Disney treatment with Glory Road, an inspiring and well done sports film that presents our country’s sordid racial past with levity and graciousness. The team has many issues to deal with on and off the court. Don Haskins (Josh Lucas) is the new head men’s basketball coach at Texas Western College (now UTEP). In order to bolster his team’s record despite the school’s lack of athletic funding, Haskins begins recruiting players without regard for race. This leads to his ’65-66 squad being predominantly black, something all but unheard of in the Jim Crow south. After putting his team through rigorous training designed to breed toughness and togetherness, Texas Western makes a run at a perfect season and an NCAA championship. Along the way, the team encounters multiple instances of racial prejudice and violence both at home and on away games. Eventually the team faces the all-white Kentucky team under Adolph Rupp in the 1966 Men’s Championship. Coach Haskins goes over a play at a critical point in a game. On the surface, Glory Road appears to be just any other, inspirational underdog tale type of sports film. It has a new coach with raw players on a team with a history of losing going against an overwhelming favorite. Some of those players have issues and so does the coach. Yet while these tropes exist, they are thankfully overshadowed by the film’s look into the inherently racist culture of college sports in the south during the 1960’s. This is a rather mature Disney film, as there are some scenes of staunch racism and hate violence against African-Americans. Sure there are some scenes of humor, including when one academically slacking player’s mother appears in the classroom to push her son, but there is also serious drama at stake. Haskin’s Texas Western team is a pariah in the white-washed south, and challenges the notions of the kind of players a basketball team should field. The team was often met with hostility when they went to play other teams. 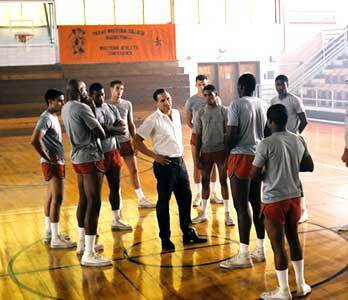 Much like Remember The Titans, Glory Road uses sports as the lens for an examination at greater issues. The trials faced by African-Americans during that terrible period are put on full-display here, and given a human face. We see the impact of a player’s beating at the hands of racist fans on a mixed-race team. Sure, this film is a tale of one of the great underdog teams in NCAA basketball history, but it is also a film about the much greater victory that team won. Eventually the team makes it to the NCAA finals..
Coach Haskins addresses his team about their play. Chucks are all over the film, as they were THE basketball sneakers of the time. The players all wear optical white high-top chucks during games and practices, with black high tops and low cuts making a few appearances off the court. Top shot of the team breaking a huddle. Glory Road. (2006) Josh Lucas, Dumaine Radcliff, James Olivard, Derek Luke, Austin Nichols, Kip Weeks, Al Shearer, Samuel Garland, Mitch Eakins, Alphonso McAuley, John Voight. Directed by James Gartner. Categories: Drama, Sports.